You want incoming Rookies hot off the draft? Got ‘em. You want Legends of the game? Got’em. You want them all in the same set? 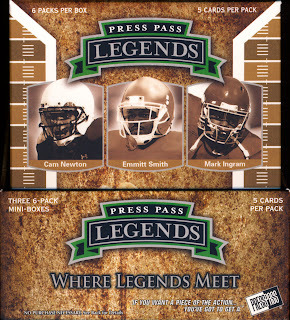 Got that too in 2011 Press Pass Legends Football. With 5 autographs and 1 jersey card in each hobby box, this is a fun break. To find out what we got in our break, check out this SPEED-break™video. I usually love Press Pass Legends... it's been my favorite collegiate product the past few years... but w/o the logos... it's just not the same. Nice break though... keep up the amazing SPEED-breaks!